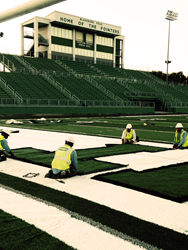 The Van Buren High School Football Team will kick off their season on a new and expanded football field this fall as Hellas finalized construction and began the turf replacement at Blakemore Field on August 3rd to be completed on the 17th. Hellas was granted the $425,000 contract out of seven bidders to manufacture and install the new playing surface, making it the second time the sports construction company works with the Van Buren School District. Hellas previously installed the synthetic turf at Blakemore Field in 2006. Hellas removed the previously installed Realgrass Pro Synthetic Turf and is replacing it with Hellas’ Velocity® Synthetic Turf, a surface recognized for its natural look and durability. The Van Buren Pointers kick off their 2015-16 football season on September 4th with a home game against the White Hall Bulldogs. Headquartered in Austin, Texas, Hellas Construction is a nationwide contractor with a strong reputation for delivering premium-quality sports construction projects across the United States. Hellas has the ability to custom-manufacture and install its own of synthetic surfaces for field sports, running tracks, and tennis courts, by controlling all related operations. For more information, visit hellasconstruction.com and matrix-turf.com or follow them on Twitter and Facebook. The Van Buren School District serves the Van Buren, Arkansas community by providing learning environment that enables students to attain their full potential and that promotes lifelong learning. To learn more about Van Buren School District please visit http://www.vbsd.us.